CITTERN. MEDIUM GAUGE. OCTAVE STRUNG. 10 - 44. LOOP-ENDS OR BALL-ENDS. A choice of phosphor or nickel round wound strings on a hex steel core. Our phosphor bronze wound strings are acclaimed throughout the world for their warm, bright, long lasting tone, they are ideal for the acoustic mandolin. Our nickel round wound strings produce a rich mellow tone. 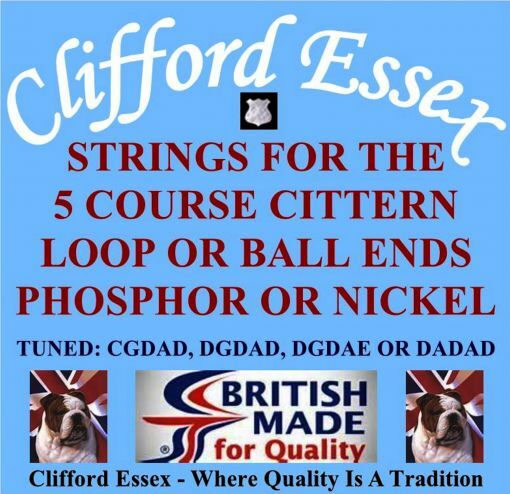 Our cittern strings are designed for 5 course citterns and best suited for long scale instruments tuned: CGDAD, DGDAD, DGDAE OR DADAD. CITTERN. DOUBLE STRUNG. LIGHT GAUGE. 9 - 42. LOOP OR BALL ENDS. CITTERN. OCTAVE STRUNG. LIGHT GAUGE. 9 - 42. LOOP OR BALL ENDS. CITTERN. MEDIUM GAUGE. DOUBLE STRUNG. 10 - 44. LOOP OR BALL ENDS. CITTERN. HEAVY GAUGE. DOUBLE STRUNG. 11 - 46. LOOP OR BALL ENDS. CITTERN. HEAVY GAUGE. OCTAVE STRUNG. 11 - 46. LOOP OR BALL ENDS. 12 STRING CITTERN. MEDIUM GAUGE. DOUBLE STRUNG. 10 - 48. LOOP OR BALL ENDS. 12 STRING CITTERN. MEDIUM GAUGE. OCTAVE STRUNG. 10 - 48. LOOP OR BALL ENDS.